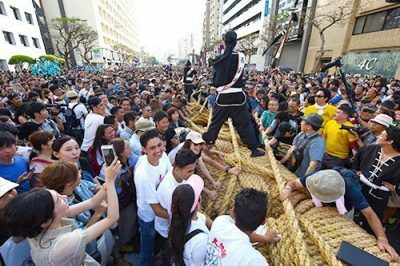 People chant and pull on the giant rope during the Naha Giant Tug-of-War on Route 58 at Kumoji, Naha City, on the evening of October 7. The 48th annual Naha Giant Tug-of-War took place at the Kumoji intersection on Route 58 on October 7. The event, organized by the Office of the Conservation Society of the Naha Giant Tug-of-War, lead to streets that brimmed with excitement from locals and tourists alike. Participants split into two teams: East and West, with 15,000 attendees on each side. The intense competition commenced at approximately 4:30 p.m., lasting 12 minutes while the crowd shouted, “Pull, pull!” The East team claimed victory after successfully bringing the rope five meters in their direction, making it their 16th win, with 14 losses and 15 draws to date. The Kumoji intersection was bursting with the energy of some 270,000 spectators according to the organizers, and the spirited competition involved a 200-meter, 40-metric ton rope. The East team claimed victory just as the previous year, having made great headway early in the game. The West side momentarily resisted, but the score was settled in 12 minutes. The crowd subsequently came together to dance the kachashi, a festive Okinawan folk dance. The mood was jubilant, with plenty of smiles to go around among the families and tourists visiting from mainland Japan and abroad. Koji Arai, 63, joined the West team with his family of three. “I enjoyed myself so much I lost my voice. I liked the sense of unity,” he said with apparent satisfaction. People chant and pull on the giant rope during the Naha Giant Tug-of-War on Route 58 at Kumoji, Naha City, on the evening of October 7. Photograph by Toyomi Takihata. The main tug-of-war event was preceded by performances by karate artists, the splitting of an ornamental paper ball filled with confetti and a parade led by a flag bearer on Kokusai street. 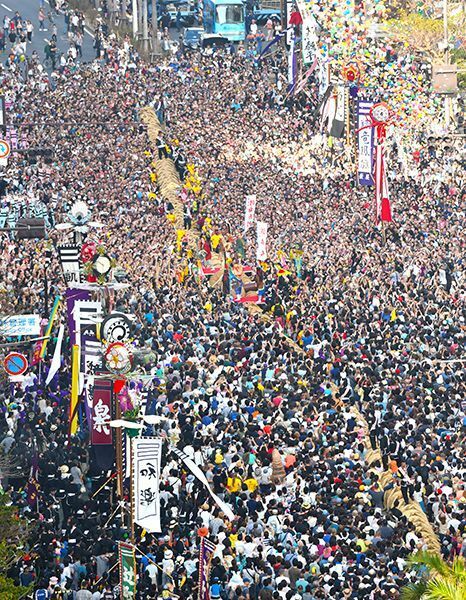 The Naha Giant Tug-of-War is said to have first started around 1450, during the Ryukyu Kingdom era. The tradition was abolished in 1935, but brought back in 1971. In 1995, the event was recorded in the Guinness Book of World Records as the largest tug-of-war event in the world.